Mark Edward Waugh AM (born 2 June 1965) is an Australian cricket commentator and former international cricketer, who represented Australia in Test matches from early 1991 to late 2002, and made his One Day International debut in 1988. Waugh is often nicknamed "Junior" as he is younger than his twin brother Steve by a few minutes. Dean Waugh, another of Mark's brothers, is also a cricketer, having played first-class and list A cricket in Australia. His nephew and Steve's son, Austin, was selected in the Australian under-19 team. He was previously a national selector, holding that position until August 2018. On 15 May 2018, he announced his intentions to swap national selector duties for TV commentating role with Fox Sports. He began as an all-rounder in the Australian ODI team, but he later focussed on batting and progressed to opening the batting, where he excelled and became Australia's leading one day runscorer. His three centuries at the 1996 Cricket World Cup made him the first batsman to ever achieve this feat, the record later equaled by Sourav Ganguly in 2003 Cricket World Cup and a fourth century in the 1999 tournament made him the only Australian to score more than 1000 runs in World Cup competition and to score four centuries. He became the leading Australian run-scorer and century maker in ODIs during the 1999 tournament. Born at Canterbury Hospital in Campsie, New South Wales on 2 June 1965, Waugh was one of twin boys born to Rudiger and Beverley Waugh. He arrived four minutes after Steve. His father was a bank official and his mother was a teacher within the New South Wales Department of Education. The family settled in the western Sydney suburb of Panania. The twins were later joined by two more brothers, Dean and Danny. From an early age, the parents introduced their children to sport. By the age of six, the twins were playing organised soccer, tennis and cricket. In their first cricket match, the brothers were both dismissed for ducks. Waugh and Mark Taylor opened on debut against Tasmania at Hobart's TCA Ground. New South Wales were sent into bat and Waugh was dismissed for 13 and New South Wales fell to 3/60 in the first innings. He scored 28 in the second innings, but the drawn match was more notable for an incident on the third morning, when the new opening pair overslept on Taylor's 21st birthday. They were punished by coach Bob Simpson with fielding driils, forcing the pair to take hundreds of catches. He took his first catch, that of Roger Woolley on debut. Waugh fell on tough times, being dismissed for a duck and four by Test bowler Merv Hughes in the next match against Victoria and then 17 and a run out for another duck against the touring New Zealand. With a first-class average of 10.33, Waugh was dropped for the next five matches. However, for the final four matches of the season, Waugh was recalled to the team as a front-line fast bowler and middle order batsman. He took 4/130 in the first innings against Queensland in his first match in the role. They were his first-class wickets. His bowling was characterised by his liberal use of short-pitched bowling. In the next match against Tasmania, Waugh opened the bowling with Mike Whitney, due to injuries to other bowlers, taking 2/31 in the first innings. Waugh then took 3/49 in the final round robin match against Queensland, before the teams met again for the Sheffield Shielf final at the Sydney Cricket Ground. Whitney and Waugh were New South Wales' only pacemen, and Waugh bowled 27 overs to take 1/71. Batting at No. 7, Waugh was involved in a century stand with Greg Dyer to help avoid the follow on with 41. Waugh made only 24 in the second innings as the home team hung on for a draw to secure the Shield. Waugh had scored 167 runs at 15.18 and took 11 wickets at 32.00 for the season. He played in one limited-overs match, scoring 13 and taking 1/28 against Victoria. Waugh was one of the leading players at the 1996 Cricket World Cup on the Indian subcontinent. Opening the batting, he scored 130 from 130 balls in Australia's opening game against Kenya in Visakhapatnam,. He combined in a 207-run partnership with his brother, the first double-century stand in World Cup history. He followed this up with 126 from 135 balls against India at Bombay, frequently hitting through cover and midwicket. The innings made him the first player to score consecutive centuries in World Cup competition. Waugh and then dismissed Sachin Tendulkar for 90 when he looked likely to win the game for India. Tendulkar charged down the pitch to Waugh's off spin, who responded by bowling a wide, resulting in the Indian's stumping. Waugh was named man of the match on both occasions. He made an unbeaten 76 against Zimbabwe in a nine-wicket win at Nagpur. He scored only 30 from 63 balls, but took 3/38 in the final group game against the West Indies at Jaipur, which Australia lost. Australia progressed to the quarter-finals, where they faced New Zealand at Madras, he scored his third century (110) to guide a successful Australian run chase, again winning the man of the match. The innings took Waugh's tournament tally to 472 runs, the record for Australia in a single tournament. Although he managed only 0 and 12 in the semi-final and final, Waugh finished the tournament with 484 runs at an average of 80.66 and a strike rate of 85.36, second only to Tendulkar. He contributed five wickets with the ball. Waugh started the tournament with a man-of-the-match 67 against Scotland at Worcester as Australia unconvincingly won by four wickets in its first match. He then scored two and 41 as Australia lost to New Zealand and Pakistan respectively, leaving them needing to avoid defeat in all of their remaining matches to win the World Cup. Waugh scored only 33 and three as Australia defeated Bangladesh and the West Indies to progress to the Super Six phase. Needing to win all their matches, Waugh top-scored with 83 against India at The Oval in a win. He then scored 104 from 120 balls against Zimbabwe at Lord's in another victory. In the process, he passed Allan Border's Australian record of 6,524 ODI career runs and became the first person to score four centuries in World Cup competition. He dedicated this achievement to his dying grandfather. He was then run out for five in the final Super Six match against South Africa. In the semi-final against same team, he was dismissed without scoring. Waugh participated in the final play of the match. With the scores tied in the last over of South Africa's run chase and with one wicket remaining, he fielded the ball as Lance Klusener and Allan Donald attempted the winning run. The South Africans had a mix-up and a run out resulted in a tie. The Australians progressed to the final as they had won their previous meeting. 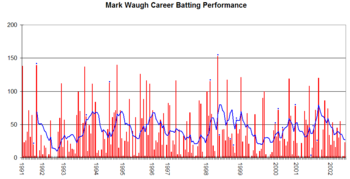 Waugh's ODI career batting performance. Note the spike near the end of his career due to the 2000–01 series. Mark Waugh's Test career batting performance graph. In 2002 he did a brief stint as Nine Network Cricket commentator during the 3 -match Australia-Pakistan ODI series. Waugh was previously a commentator on Network Ten for the Big Bash as well as a national selector. In 2018 Ten lost the rights to the Big Bash. In 2018/19 Waugh will join Adam Gilchrist as a cricket commentator for Fox Sports. After separating from Sue Porter  - his partner of 17 years in 2004 - he then married Sydney Cup-winning thoroughbred trainer Kim Waugh (née Moore) on 9 April 2005. ^ "Waugh, Sutherland headline U19 Cup squad". Retrieved 13 January 2018. ^ "Waugh 'quits' CA in surprise exit". News.com.au. 14 May 2018. Retrieved 28 July 2018. ^ a b c d e f g h i j k l Cashman, pp. 320–323. ^ "Most catches in career – ESPN CricInfo". Retrieved 22 November 2016. ^ a b Knight, p. 111. ^ Knight, pp. 9, 13. ^ a b c d Knight, p. 8. ^ a b c Perry, p. 348. ^ a b Knight, p. 14. ^ a b c Knight, p. 15. ^ a b Knight, p. 23. ^ a b Knight, p. 26. ^ a b c Knight, p. 27. ^ a b Perry, p. 349. ^ a b Knight, p. 29. ^ a b Knight, pp. 31–32. ^ "The last of cricket's cavaliers". Cricinfo. 16 February 2004. ^ a b c Knight, pp. 64–65. ^ a b Knight, p. 79. ^ a b Knight, p. 84. ^ a b c d Knight, p. 85. ^ a b Knight, p. 371. ^ a b Knight, p. 94. ^ a b c Perry, p. 352. ^ a b Knight, p. 75. ^ Knight, pp. 2, 198–109. ^ "Statsguru – SR Waugh – Tests – Innings by innings list". Cricinfo. Retrieved 5 June 2008. ^ a b c d Knight, p. 3. ^ a b c d e f g h i j k l m n "Statsguru – ME Waugh – Tests – Innings by innings list". Cricinfo. Retrieved 5 June 2008. ^ a b Knight, p. 112. ^ a b Knight, p. 114. ^ a b c d e f g h i j k "Statsguru – ME Waugh – ODIs – Innings by innings list". Cricinfo. Retrieved 5 June 2008. ^ a b c Knight, pp. 124–125. ^ "Cricinfo Statistics for the 5th Test: Australia v England at Perth, Feb 3–7, 1995". Cricinfo. Cricinfo. Retrieved 4 January 2016. ^ Reiffel: We'll take it from here. ^ a b Knight, pp. 219–220. ^ a b Knight, p. 222. ^ a b Knight, p. 223. ^ a b Knight, p. 224. ^ a b Knight, p. 226. ^ a b Knight, p. 225. ^ a b c Knight, p. 230. ^ a b c Knight, p. 231. ^ a b Knight, p. 237. ^ a b Knight, p. 242. ^ a b Knight, p. 248. ^ a b c Knight, p. 251. ^ a b c Knight, p. 258. ^ a b Knight, p. 263. ^ a b Piesse, p. 229. ^ a b c Knight, p. 267. ^ a b Knight, p. 265. ^ a b Perry, p. 356. ^ Piesse, pp. 32–33, 165. ^ a b Knight, pp. 274–275. ^ a b Knight, p. 276. ^ a b Knight, p. 282. ^ a b Knight, p. 299. ^ a b Knight, p. 300. ^ a b Knight, p. 301. ^ a b c Knight, p. 302. ^ a b Knight, p. 308. ^ "Mark Waugh marries". The Sydney Morning Herald. Retrieved 22 November 2016. ^ Camp Quality (2007). Laugh Even Louder!. Gosford, New South Wales: Scholastic Australia Pty Limited. p. 23. ISBN 978-1-74169-022-4. Knight, James (2003). Mark Waugh:the biography. Harper Collins. ISBN 0-7322-7493-1. Perry, Roland (2000). Captain Australia: A history of the celebrated captains of Australian Test cricket. Sydney: Random House Australia. ISBN 1-74051-174-3. Piesse, Ken (1999). The Taylor Years: Australian cricket 1994–99. Penguin Books Australia. ISBN 0-670-88829-X. Benaud, Richie (1991). Border & Co: A Tribute To Cricket's World Champions. Hamlyn Australia. ISBN 0-947334-31-9. Meher-Homji, Kersi (2000). Famous Cricketing Families: from Graces and Headleys to Chappells and Waughs. Kangaroo Press. ISBN 0-7318-0888-6. Wikimedia Commons has media related to Mark Waugh.